These RF switches are ideal for installation into EW (electronic warfare) systems, communications systems, test equipment, filter selectors, electronic simulators, and antenna selectors. They’re designed to have outstanding isolation between ports from a low isolation of 55dB to over 80dB and are available as a single pole/single throw up to a single throw eight way switch. Each switch lid is epoxy sealed and screened to achieve an ideal overall design. Standard switches are designed to handle a 1 watt Continuous Carrier (CW) and switching times range from 50 nanoseconds to 200 nanoseconds with very low insertion loss. 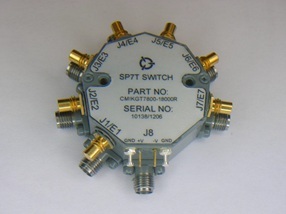 Corry Micronics will also custom design RF switches in accordance with required specifications. Contact Corry Micronics for more information or to see if their RF switch offerings are ideal for your next application.